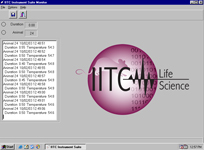 The IITC Series 8 software is available for each Series 8 unit. The individual software will capture data in real-time from one of the units and can be exported into Excel or other spreadsheet programs. The data supplied will depend on which Series 8 equipment is used with the corresponding software.